Nelson Mandela, whose successful struggle against South Africa's apartheid system of racial segregation and discrimination made him a global symbol for the cause of human rights and earned him the Nobel Prize, would have turned 100 years old on Wednesday. On the anniversary of his birth, here are 100 facts about the historic peacemaker who died in 2013, reports Usa Today. 1. Nelson Mandela was the first black president of South Africa from 1994-1999 and the first president elected after the end of apartheid, an extensive system of segregation and discrimination based on race. 2. Mandela’s real first name is Rolihlahla, meaning "pulling the branch of a tree" or "troublemaker." He was given the name Nelson by a teacher because, in the early 20th century, South African children were often given English names due to the colonial presence in the country. 3. For over 20 years, Mandela worked for the African National Congress, the opposition party that advocated for black civil and human rights under apartheid. 4. 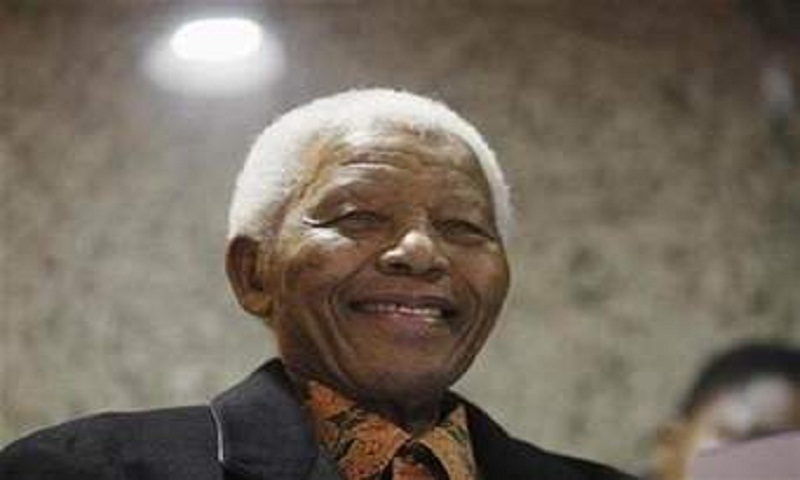 Mandela's father, Nkosi Mphakanyiswa Gadla Mandela, died from lung disease. Nelson was 12 years old at the time. 5. Mandela was then raised by a Thembu regent, Chief Jongintaba Dalindyebo, for whom his father was an adviser. The Thembu people traditionally reside in the eastern part of South Africa. 6. Mandela often disguised himself to escape being arrested for his political activity, dressing like a fieldworker or a chef to evade the police. 7. Dressed as a chauffeur, Mandela was arrested on August 5, 1962 for inciting strikes and leaving the country without permission. He would be in jail until 1990, serving time in multiple prisons including Robben Island, where he spent 18 years. 9. In prison, Mandela lived in a small cell without a bed or plumbing, forced to do hard labor in a limestone quarry during the day. 10. His work in the quarry permanently damaged Mandela’s eyes, injuring his tear glands so severely that the leader could not produce tears later in life. 11. Mandela earned his bachelor of law degree from the University of South Africa while imprisoned. 12. Robben Island was jokingly called the “University of Robben Island” because many of Mandela’s fellow inmates learned to read and write and debated politics and history while serving time alongside the leader. Some inmates even earned “diplomas” signed by Mandela. 13. Mandela communicated with other anti-apartheid leaders, such as Desmond Tutu and Oliver Tambo, while still in prison. He also completed drafts of his best-selling autobiography "Long Walk to Freedom." 14. Mandela had six children: Madiba, Makaziwe, Magkatho, Pumla, Zenani and Zindzi. He also had 17 grandchildren and 19 great grandchildren. 15. Three of Mandela’s children have died. Madiba died of a car accident at 24, Makaziwe died in infancy and Magkatho died of HIV/AIDS complications at 55. 16. Mandela had three sisters, three half-brothers and six half-sisters. 17. He was raised in Qunu, South Africa as a member of the Xhosa-speaking Thembu tribe. 19. Mandela exercised every morning for the 27 years he spent in prison, according to the BBC. 21. Mandela was baptized into the United Methodist Church and graduated from a Methodist high school. 22. The leader was the first in his family to receive a formal education. 23. Though Mandela started college at the University of Witwatersrand, he was expelled for participating in student protests. 24. In college, Mandela thought he would pursue a career as an interpreter or clerk in the Native Affairs office of the South African government. 25. Mandela also picked up acting and ballroom dancing at the university. 26. After he was expelled, Mandela moved to Johannesburg in 1941 to avoid an arranged marriage by tribal leaders. 27. Mandela’s first job after moving to Johannesburg was as a security guard at a mining company, where he also finished his bachelor’s degree through the University of South Africa. 28. He became more interested in South African politics when he started working as a law clerk at the law firm Witkin, Sidelsky and Eidelman after moving to Johannesburg. 29. In 1952, he opened the first South African black law partnership with a friend. 30. In the same year, Mandela traveled around South Africa, leading the African National Congress Campaign for the Defiance of Unjust Laws. He promoted the Freedom Charter, a statement of the core principles of the ANC that advocated for equality for all South African people. 31. He was the only black student in his law school class at the University of Witwatersrand. 32. Mandela considered himself a poor student in college and law school, calling himself "dismal," in his autobiography. 33. During law school, Mandela became increasingly involved in politics, participating in a successful bus boycott to protest rising fares. 34. In 1951, Mandela helped form the youth wing of the ANC, uniting young adults throughout South Africa against apartheid. 35. Nelson Mandela was married to three women during his life: Evelyn Mase, Winnie Madikizela and Graça Machel. 36. Mandela married Evelyn Mace, a nurse, in 1944. The couple had two sons and two daughters, but they divorced in 1958. 37. Mandela was married to Winnie Mandela from 1958 until 1996. She was an anti-apartheid activist and served as the Deputy Minister of Arts, Culture, Science and Technology in South Africa from 1994-1996. 38. Mandela was indicted for treason in 1955 for advocating for a violent overthrow of the South African government, though he was acquitted in 1961. 39. In 1960, the ANC was banned in South Africa. The group was forced to operate underground. During this time, Mandela advocated for a military wing of the ANC called Umkhonto we Sizwe, or Spear of the Nation. 41. During the early 1960s, Mandela traveled around Africa and throughout England to garner support for the anti-apartheid movement, even receiving military training in Morocco and Ethiopia. 42. The press referred to Mandela as the “Black Pimpernel,” a reference to Emma Orczy's 1905 novel "The Scarlet Pimpernel," which features a character who hides from authorities during the French Revolution. 43. Mandela would also call individual reporters during this time, telling them about the police’s ineptitude and how he would evade them. 44. According to the Nelson Mandela foundation, as a child, Mandela was inspired to fight for justice by the stories of his ancestors who also advocated for equality in South Africa. 45. The CIA played a role in Mandela’s ultimate arrest in 1962, tipping off South African authorities for fear he supported communism and would help its spread around the world. 46. Initially, Mandela was classified as a Class D prisoner. This meant he could only receive one visit and one letter every six months on Robben Island. 48. Mandela was jailed with fellow ANC revolutionary Walter Sisulu, who also helped lead the fight against apartheid in South Africa. 49. Mandela was not allowed to attend the funeral of his son or of his mother while he was in prison. Mandela’s mother died in 1968, and his son, Madiba, died in 1969. 50. Mandela’s served his sentence in three prisons in South Africa: Robben Island, Pollsmoor Prison and Victor Verster Prison. 52. In 1994, Mandela campaigned on “a better life for all,” promising to extend access to water, electricity, education and housing for all South Africans when he was running for president of South Africa. 53. Mandela advocated for the voting age to be lowered from 14 to 16 in South Africa in the 1994 elections, though the policy was never enacted. 54. Mandela was overwhelmingly elected president. The ANC received over 60 percent of the popular vote. 55. In 1995, Mandela established the Truth and Reconciliation Commission, which investigated human and civil rights violations committed against black South Africans under apartheid. 56. The commission held over two years of hearings investigating sexual assault, torture, assassination and other injustices committed against black South Africans. Mandela called the commission a success and said it “has helped us move away from the past to concentrate on the present and the future." 57. Mandela served only one term as president. 59. Unification between white and black South Africans was central to Mandela’s administration, even appointing members of the National Party, the ruling party under apartheid, to his presidential cabinet. 60. During the 1995 Rugby World Cup, Mandela encouraged black South Africans to root for the South African team, the Springboks. The team, which had been banned from international competition due to apartheid, became a launching point for reconciliation in South Africa. 61. Mandela also appointed Frederik Willem de Klerk, the last South African president under apartheid, to co-serve as the Deputy President of South Africa from 1994-1996 with Thabo Mbeki, a black South African. 62. Mandela’s administration focused on closing the disparity in wealth and resources between white and black South Africans. In 1994, nearly 30 percent of South Africans lacked a safe supply of water. In 1999, that number was approximately 20 percent. 63. During Mandela’s administration, 1.5 million more South African children were enrolled in school and 2 million people gained access to electricity. 65. Mandela entertained celebrities such as Sugar Ray Leonard, Michael Jackson and Whoopi Goldberg in South Africa. 67. During his tenure, Mandela encouraged other nations to heal national divisions through reconciliation, including the Israeli-Palestinian conflict and the conflict between India and Pakistan. 68. Mandela helped meditate the ethnic conflict between the Tutsi and Hutu groups in the Burundian civil war after his term as president. 69. In 1999, Mandela established the Nelson Mandela Foundation. According to their website, the non-profit is focused on promoting dialogue about equality and continuing Mandela's legacy for peace. 70. Mandela also established the Nelson Mandela Children’s Fund in 1995 to help children struggling with hunger, abuse, exploitation and homelessness. 72. After his term as president, Mandela worked with the Nelson Mandela Foundation to address rural poverty and inequality in South Africa. 73. In 2007, a bronze statue of Mandela was mounted in Parliament Square in London. When the statue was unveiled, Mandela said, "The history of the struggle in South Africa is rich with the stories of heroes and heroines, some of them leaders, some of them followers. All of them deserve to be remembered. We thank the British people once again for their relentless efforts in supporting us during the dark years." 74. Mandela has received over 200 different awards for his contributions to peace in South Africa, including the Presidential Medal of Freedom. 75. In 2012, scientists on South Africa’s southwest coast named a newly-discovered species of woodpecker after the leader called nelsonmandelai. 77. In 2005, Mandela founded the Mandela Rhodes Scholarship that provides postgraduate funding for African students. 78. Mandela’s favorite food was tripe, the stomach lining of farm animals like cows and sheep. 79. Mandela also enjoyed citrus pudding, orange turkey and peanut butter and spinach soup. 80. A lifelong fan of Indian food, his first meal after being released from prison was chicken curry. 81. Mandela appears in Spike Lee’s 1992 film "Malcolm X." He played a teacher and recited speeches by civil rights leaders. 82. Mandela dedicated "Long Walk to Freedom" to his children, grandchildren and great grandchildren. 83. Mandela also published "Conversations with Myself" in 2010, a collection of his speeches, letters and other talks. 84. On his 80th birthday, Mandela was married to Graça Machel, a widow of the former president of Mozambique, Samora Machel. 85. Mandela loved music, once saying “Music is a great blessing. It has the power to elevate and liberate us. It sets people free to dream. It can unite us to sing with one voice. Such is the value of music.” Mandela would often sing traditional South African songs to cheer up his fellow prisoners. 86. In 2003, Mandela hosted the first 46664 concert, named after his prison number, at Green Point Stadium in Cape Town. The concert raised awareness about the spread of HIV/AIDS in South Africa. 87. The ANC was deemed a terrorist organization under the Reagan administration. Mandela was still technically on U.S. terrorist watchlists until 2008. 88. President Bill Clinton and Nelson Mandela were in office at the same time, and the two leaders were close. Clinton said Mandela often asked about Hillary and Chelsea Clinton, and Mandela would ask Chelsea about her homework on the phone. 89. President Barack Obama called Mandela a “giant of history” in his eulogy at Mandela’s 2013 funeral. 90. Mandela met with first lady Michelle Obama during her 2011 trip to South Africa. 92. In 2007, Mandela helped establish the Elders, a group of global leaders who promote peace and human rights worldwide. Members of the group have included former president Jimmy Carter, former secretary-general of the U.N. Ban Ki-moon and former secretary-general of the U.N. Kofi Annan. 93. Mandela made his final public appearance during the World Cup closing ceremony in 2010 at the age of 92. The final came down to Spain and the Netherlands, with Spain taking home its first World Cup victory. 95. Mandela helped popularize the “Madiba shirt,” a traditional silk shirt typically with a colorful print. 96. On Dec. 5, 2013 Nelson Mandela died at home in Houghton, South Africa, due to a recurring lung infection. 97. Mandela’s memorial service was held at the First National Bank Stadium in Johannesburg. It was attended by family, South African leaders and more than 91 heads of state. 98. Memorials were also held in Washington, D.C., Abu Dhabi and London following the leader’s death. 99. In November 2009, the U.N. declared July 18 – the leader’s birthday – Mandela Day in honor of his contribution to peace around the world. 100. Many South Africans refer to Mandela as “mkhulu,” which means grandfather in Zulu. Research from the Nelson Mandela Foundation, The New York Times, Reuters, the Nobel Foundation and Long Walk to Freedom.